Power amplifier is the part of sound electronics. It is designed to maximize the magnitude of the power of given input signal. In sound electronics, the operational amplifier increases the voltage of the signal, but unable to provide the current, which is required to drive a load. 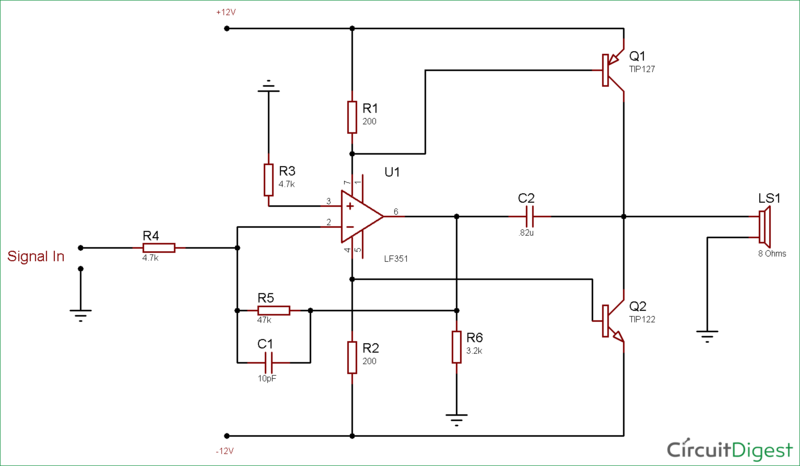 The schematic for 10 watt amplifier is pretty simple, the LF351 amplifies the signal voltage and two Power Transistors provide the necessary power amplification. The power is directly taken from the power supply and provided to the 8 Ohms Loud Speaker via two transistors. As Sinusoidal wave change the polarity, TIP127 provides the power amplification on positive peak and TIP 122 provides the power amplification on negative peak signals. In this circuit, TIP122 and TIP 127 are two major components. Those two transistors are identical pair with 100V Collector-Emitter Sustaining Voltage @ 100 mA. Both ICs provide high DC Current gain- hFE= 2500 typically. In the above image, the TO-220B package is shown, both Transistors are available in this package. This package is essential for perfect heat transfer and useful to fit with a heatsink. These transistors are biased using the 200R resistors. The Amplified output is taken from the collector junction of TIP122 and TIP127. 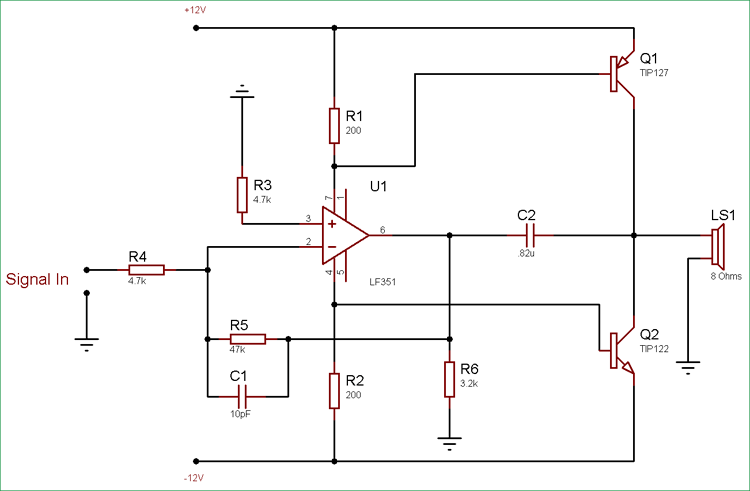 We are powering the circuit using + / - 12V and the input sinusoidal signal is provided. The oscilloscope is connected across the output against 8 ohms load on channel A (Yellow) and the input signal is connected across channel B (Blue). We can see the output difference between the input signal and the amplified output in the video given below. We connected an AC multi-meter across the output. AC voltage shown in the multi-meter is peak to peak AC voltage. We provided very Low-frequency sinusoidal signal of few 25-50Hz. As in low frequency, the amplifier will deliver more current to the load and the multimeter will be able to detect the AC voltage properly. It is good to use audio grade rated box type capacitors for better result. Try to use 8 Ohms higher efficiency speaker to drive with this power amplifier. recently I build the amp, but i'm experiencing crossover distortion. seems like the dc current through the stage doesn't "open the transistors" my Ube voltage is 0.53V over 200ohm resistors.